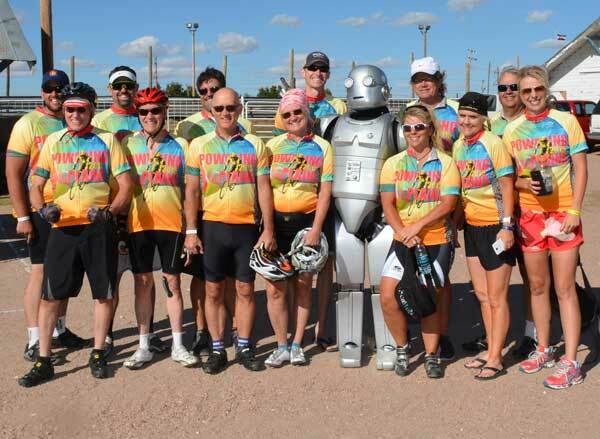 The 2015 Powering the Plains bike team with their mascot, Power. Electric cooperatives have been among the corporate sponsors for Pedal the Plains since its inception in 2012. The annual fall bike tour of Colorado’s eastern plains began as a joint effort of Gov. John Hickenlooper and The Denver Post to bring attention to the importance of the eastern side of the state and its agricultural contributions. The co-ops, along with Tri-State Generation and Transmission, CREA and Colorado Country Life, help sponsor the September event. The co-ops also sponsor a bike team that rides under the Colorado’s Electric Cooperatives: Powering the Plains banner. 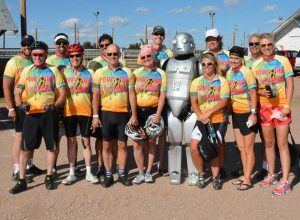 In 2018, the bicyclists will ride from Kiowa to Bennett to Limon and back to Kiowa September 14-16. The Powering the Plains bike team will ride to raise money for Energy Outreach Colorado. More information on the co-ops’ participation is available at www.poweringtheplains.coop.